The 2017 Shady Records/Interscope signee reflects on his life and the journey to get where he is now on his brief, but potential-filled debut studio album, Everything’s for Sale. Boogie opens up with a part-spoken word introspective track, reflecting on his desire for success and love. 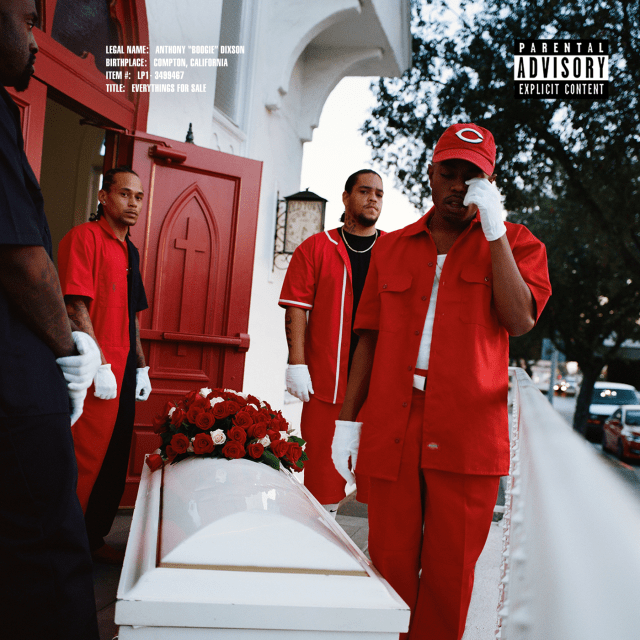 Boogie also flexes his singing talents on the album’s third cut, ’Swap Meet’, where he uses bargaining at a swap meet as an analogy for his relationship with his significant other. He’s grateful for her love, stating, “Your love like gold, and what you charging? / Just keep it low ‘cause that’s a bargain” on the sung chorus. JID assisted track, ’Soho’ is criminally short; the song ends before it can even get going, which is unfortunate because JID and Boogie seem to work together well, at least stylistically. Most of this album is filled with mellow, downtempo production. Sonically, this album stands out in the sea of spacey trap beats and hi-hats that is making up the top charts right now. The two exceptions to this are the Eminem featured ‘Rainy Days’, which seems to adopt more of a trendy beat and hook. The Eminem verse starts falling apart towards the second half and it’s pretty evident it was just padded out to increase the length of the song. The other track is the lead single, ‘Self Destruction’, which utilizes both a trendy flow and beat to not much success. Although there are flashes in the pan, most of the songs on this album are too short for them to go anywhere artistically. There are attempts at substance, but it comes off as shallow simply due to its brevity. Boogie’s smooth and introspective style is somewhat refreshing, yet the album as a whole falls short and is bogged down by cuts that attempt to be more radio-friendly, which takes away from the more meaningful tracks. FAV TRACKS: 1. (Tired/Reflections), 2. (Silent Ride), 3. (Swap Meet), 5. (Soho [feat. JID]), 10. (Whose Fault), 13. (Time [feat. Snoh Aalegra]) | Listen to the project!